San Diego, CA 92103, USA. METHODS: Three boys and 5 girls, age 11 +/– 2 years (mean +/– SD) underwent T2 weighted sagittal and coronal MRI scans of the lumbar spine while standing. Scans were repeated with 4, 8, and 12 kg backpack loads, which represented approximately 10%, 20%, and 30% body weight for our sample. Main outcome measures were disc compression, defined as post- minus preloading disc height, and lumbar asymmetry, defined as the coronal Cobb angle between the superior endplates of S1 and L1. RESULTS: Increasing backpack loads significantly compressed lumbar disc heights measured in the midline sagittal plane (P < 0.05, repeated-measures analysis of variance [ANOVA]). Lumbar asymmetry was: 2.23 degrees +/– 1.07 degrees standing, 5.46 degrees +/– 2.50 degrees with 4 kg, 9.18 degrees +/– 2.25 degrees with 8 kg, and 5.68 degrees +/– 1.76 degrees with 12 kg (mean +/– SE). Backpack loads significantly increased lumbar asymmetry (P < 0.03, one-way ANOVA). Four of the 8 subjects had Cobb angles greater than 10 degrees during 8–kg backpack loads. Using a visual-analogue scale to rate their pain (0–no pain, 10–worst pain imaginable), subjects reported significant increases in back pain associated with backpack loads of 4, 8, and 12 kg (P < 0.001, 1-way ANOVA). Despite growing parental concern regarding heavy backpack loads in schoolchildren and their association with childhood back pain, there are no known radiographic studies of the pediatric spine response to backpack loads. Radiation risk to normal subjects from detailed roentgenographic or computed tomography analysis has precluded such studies, and the current data set is limited to estimates made with anatomic markers. [5, 6] Only a biplane radiographic vertebral analysis can appropriately describe changes in disc height, lumbar lordosis, and spinal asymmetry. There are several radiographic studies describing the effects of axial loading in the adult [7, 8] and pediatric spine. These studies compare supine and simulated upright lumbar spine loading but do not describe the increased loads caused by typical school backpack loads in children. A new standing magnetic resonance imaging (MRI) imaging device permits detailed radiographic analysis of the lumbar spine response to backpack loads without risk of radiation. The purpose of this study is to measure lumbar disc compressibility and lumbar spine curvature in response to school backpack loads in children. We hypothesize that typical school backpack loads significantly decrease lumbar disc height and increase lumbar curvature. This study is a repeated measures design to measure the lumbar spine response to typical school backpack loads in healthy children. The lumbar spine in this setting was imaged for the first time by an upright MRI scanner (FONAR Upright MRI, Melville, NY). Three boys and 5 girls, aged 11 ± 2 years (mean ± SD) were recruited by flyer distribution at local schools. Inclusion criteria were healthy children aged 9 to 14 with no history of back pain, scoliosis, or spine surgery. Written child assent and parental informed consent were obtained per UCSD IRB guidelines. Subjects weighed 44 ± 9 kg (mean ± SD) and were all between age-adjusted 25th and 75th percentiles for height and weight. After resting for 30 minutes supine, subjects underwent sagittal T2 scans of the lumbar spine first supine, then standing. A Jansport backpack (San Leandro, CA) loaded with 4 kg of ceramic tiles was then placed on the subject's shoulders in the standard, 2–strap condition, and sagittal T2 scans were repeated. The subject then repeated the measurements with 8 kg and 12 kg backpack loads. These loads represented approximately 10%, 20%, and 30% body weight for our sample population. The empty backpack weighed approximately 500 g.
Lumbar disc height on midline sagittal T2 images was defined as the average of anterior and posterior disc heights. Data are presented in terms of compressibility, defined as postloading disc height minus supine disc height. Lumbar lordosis was defined as the sagittal Cobb angle between the superior endplates of S1 and L1. Lumbar asymmetry was defined as the coronal Cobb angle between the superior endplates of S1 and L1. Distances and angles were measured twice by a radiologist, and the 2 results were averaged. There was never a difference between the 2 results of >10%. To compare loading among all 6 lumbar discs under study, a 6 × 4 (6 discs × 4 loading conditions) repeated measures analysis of variance (ANOVA) was performed, and significance was set at P < 0.05. A 1 × 4 one-way ANOVA was performed for lordosis and asymmetry data and significance was set at P < 0.05. Recumbent data for compressibility, lordosis, asymmetry, and pain were not included in ANOVA analysis in order to isolate the effects of load on disc height and spinal curvature. All pairwise comparisons were adjusted for multiple comparisons using the Sidak test and a P-value of P < 0.05. A priori and post hoc power calculations were performed with G*Power  and all other statistical analyses were performed with SPSS software (SPSS, Chigago, IL). Increasing backpack loads significantly compressed the T12–L1, L1–L2, L2–L3, L3–L4, L4–L5, and L5–S1 disc heights (Figure 1, P < 0.05, repeated measures ANOVA). In addition, the caudal lumbar discs were more compressible, with the L5–S1 disc about twice as compressible as the T12–L1 disc (Figure 1, P < 0.05, repeated measures ANOVA). Interaction between disc and load was nonsignificant, indicating that each disc responded to increasing loads similarly (P > 0.05, interaction between disc and load). With pairwise comparisons among discs, only 2 disc levels were significantly different, with L2–L3 significantly more compressible than L1–L2 (P < 0.05). With pairwise comparisons among loads, 4, 8, and 12 kg loads each caused significantly more disc compression than standing without a backpack load (P < 0.05), but differences among compression caused by each load were not significant. With pairwise comparisons between loads by disc, L4–L5 and L5–S1 demonstrated significant differences between standing and 4 kg loads, while L3–L4, L4–L5, and L5–S1 demonstrated significant differences between standing and 8 kg loads, and T12–L1, L3–L4, L4–L5, and L5–S1 demonstrated significant differences between standing and 12 kg loads. Disc level L3–L4 demonstrated a significant difference in compressibility between 4 kg and 12 kg loads. As demonstrated in Table 1, backpack load correlated linearly with disc compressibility at each disc level, with r 2 ranging from 0.10 at T12–L1 and steadily increasing to 0.23 at L5–S1. Changes in lumbar lordosis were quite variable as children adjusted their posture to higher backpack loads (Figure 2). No significant changes in lumbar lordosis were seen in response to load (P = 0.767, 1–way ANOVA, post hoc power analysis = 0.35). Backpack loads caused lumbar spinal asymmetry (Figure 3). The coronal Cobb angle from the superior endplates of S1 and L1 was measured during all loading conditions. Backpack loads of 4, 8, and 12 kg significantly increased lumbar asymmetry (P < 0.03, 1–way ANOVA). Four of the 8 subjects had Cobb angles greater than 10° during loading, and 1 subject had a Cobb angle of 21.1° (Figure 4) during the 8 kg load. Five subjects had a lumbar curve to the right, and 3 subjects had a lumbar curve to the left. All subjects maintained the same direction of curvature throughout the loading conditions. Although the correlation coefficient was small, lumbar asymmetry correlated linearly with backpack load (r 2 = 0.124, P = 0.015). Pain was associated with backpack loading (Figure 5). Using a visual-analogue scale to rate their pain (0–no pain, 10–worst pain imaginable), subjects associated backpack loads of 4, 8, and 12 kg with significant increases in back pain (P < 0.001, 1–way ANOVA). Pain was positively correlated with backpack load (r 2 = 0.711, P < 0.001). To our knowledge, this is the first upright MRI study to demonstrate decreases in lumbar disc height and increases in lumbar asymmetry due to typical school backpack loads in children. Kimura et al found increases in lumbar lordosis at L3–L4 and L5–S1 with a 50% body weight axial load, which was intended to mimic upright posture. Macias etal also found that axial loading in a supine MRI caused increases in lumbar lordosis, measured from T12–L1 to L5–S1. Chow etal found decreases in lumbar lordosis and increases in thoracic kyphosis with increasing load due to backpack weight while standing. Although our comparable data are not significant, the trend is similar to published data. We postulate that lordosis is decreased in supine posture and that lordosis increases with standing and other axial loads. A backpack load is not an axial load, however, and for the load to stay balanced over the subject's center of mass, thoracic kyphosis must increase. This causes a lever-arm effect as flexion occurs at the lumbar spine and lumbar lordosis decreases. Since many of our subjects moved frequently to change the load center of mass between image acquisitions, this may have introduced variability in our data. Most children will carry their backpacks with both straps,  but occasionally will carry their backpacks using only 1 shoulder strap. 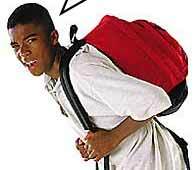 It has been established that asymmetric load carrying in children due to using only 1 backpack strap likely contributes to low back pain. Negrini and Negrini found that the postural response to a 1–strap asymmetric backpack load was to elevate the loaded shoulder and laterally deviate the trunk away from the load so as to reposition the load over the subject's center of mass. They did not find lumbar asymmetry with subjects wearing a pack in a 2–strap condition; however, anatomic markers were placed on the skin overlying every other spinous process. Pascoe etal also reported significantly increased lumbar asymmetry, about 17° with a 1–strap condition, but no lumbar asymmetry with a 2–strap condition. Both studies used anatomic markers on the skin to quantify coronal asymmetry. Chow etal found that increasing backpack load was associated with increasing pelvic obliquity and rotation in normal children and children with adolescent idiopathic scoliosis, but these investigators did not measure the lumbar spine itself since their anatomic skin markers that did not include the lumbar spine. Studies with anatomic skin markers are unable to measure true Cobb angles and thus may not be able to detect lumbar spine asymmetry. A recent study found asymmetric load distribution in children wearing backpacks with both straps adjusted to equal length, with children tending to load the right shoulder significantly more than the left. Asymmetric loading was not associated with handedness; this latter study had a small sample size. Our study found that asymmetry increased with weight up to the 8 kg load, but subsequently decreased with the 12 kg load. Subjectively, we noted that our subjects could tolerate the 8 kg load with minimal postural adjustment. With the 12 kg load, however, most subjects attempted to readjust both posture and load before imaging. As with all loading conditions, subjects carried the load in the standard, 2–strap condition. Our study has some limitations. A lumbar coil was used to image the lumbar spine. Because the entire spine was not imaged, coronal measurements did not accurately reflect a true scoliosis measurement, since the apex and endpoints of the curve were not identified. The coronal Cobb angles measured in this study likely underestimate the true coronal curvature of the spine under load. In addition, our study did not control for time of day, since the spinal column shortens throughout the day. Each of our subjects had been ambulatory for at least an hour before the required 30–minute of supine rest. Since most of the daily disc height decrease occurs during the first hour after rising, the required supine rest period likely imposed some uniformity on the disc heights. It would have been difficult to impose a longer period of rest on our sample population. The amount of time our subjects experienced load may underestimate the amount of time per day that children typically wear backpacks. Packs were worn for approximately 10 minutes at each load for a total of about 30 minutes, whereas children typically carry backpacks for between 30 and 60 minutes per day. However, our loading times were contiguous whereas children typically wear their backpacks intermittently throughout the day. Since backpack loading induced coronal asymmetry, midline sagittal disc heights may have been oriented obliquely to the perpendicular axis. It is possible that we overestimated postloading disc height and therefore underestimated disc compression. Finally, our pain data were not specific to low back pain and likely captured shoulder, thoracic, and lumbar pain caused by the pack. This study is the first radiographic analysis to describe the lumbar spine in children wearing backpacks. Lumbar asymmetry induced by backpack loading is a new and unexpected finding. Low back pain in children may be worsened by discogenic or postural changes. Future studies should be directed at upright MRI analyses of spine loading in children with idiopathic low back pain and compared with the present study of normal children.